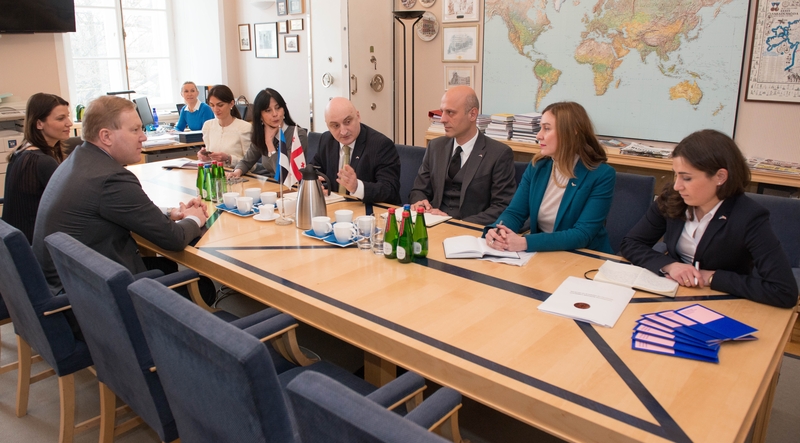 Today, the National Defence Committee and the Foreign Affairs Committee of the Riigikogu (Parliament of Estonia) met with the Deputy Minister of Foreign Affairs of Georgia David Dondua and the delegation accompanying him. Visa-free access to the European Union and Georgia’s integration with NATO were discussed at the meeting. Chairman of the Foreign Affairs Committee Sven Mikser said that Georgia had fulfilled all the necessary requirements for a visa-free regime with the EU. Speaking of Georgia’s integration with the EU, he mentioned the importance of continuing with the reforms. The European Commission has proposed to lift visa requirements for the citizens of Georgia. This has to be approved by the European parliament and the Council. When the visa-free regime has been adopted, the citizens of Georgia who have biometric passports can stay in the Schengen Area for 90 days. Dondua said that the visa-free regime was a very important signal for the population of Georgia in the process of integration with the EU, and it would be a basis for moving towards the EU membership. He also said that in relations with NATO, Georgia was striving for membership instead of the present status of a partner country; in order to achieve this, Georgia is ready to increase its defence expenses and improve its readiness for defence. At the meeting, Chairman of the National Defence Committee Marko Mihkelson highlighted Georgia’s progress in the integration with NATO, and confirmed Estonia’s continuing strong support to Georgia’s movement towards NATO membership. “In today’s security situation, close cooperation with NATO is of extreme importance,” Mihkelson said. He emphasised the need to continue defence cooperation before the Warsaw Summit, and formulate the aims of the country clearly. Mihkelson noted that it was important that all East-European countries would be taken seriously in Warsaw. “For many countries it is of critical importance which strategy the Western countries will choose in relations with Russia,” Mihkelson said. He added that the allies had a good potential for achieving consensus in Warsaw in order to unitedly confront Russia’s aggressive policy not only on the territories of the allies, but in the whole Europe. Security situation in the region, Russia’s aggressive behaviour and propaganda activities, and the situation in Abkhazia and South Ossetia were also discussed at the meetings. The meeting of the Foreign affairs Committee with Dondua was attended by Chairman of the Committee Sven Mikser and members Anne Sulling, Keit Pentus-Rosimannus, Eerik-Niiles Kross and Juhan Parts.